Robert Dak, center, air balance superintendent at ACCO Engineered Systems inSouthern California, passes out study materials during the NEMI TABB Supervisor Class. More than 150 contractors, training coordinators, instructors and staff members attended the 14th annual ICB Conference April 27 through May 1 in Austin, Texas. This year’s joint labor and management event offered numerous classes, workshops and seminars on a variety of current industry topics specifically geared toward working sheet metal professionals, presented by some of the top specialists in their fields. Classes were divided into two categories: technician and supervisor classes, and labor and management classes. Through NEMIC, ICB provided certification testing for supervisors, technicians and contractors who qualified. In today’s marketplace, certification is highly regarded and, in some cases, mandated for sheet metal workers to complete certain projects. Certification denotes competency and reliability among qualified professionals. 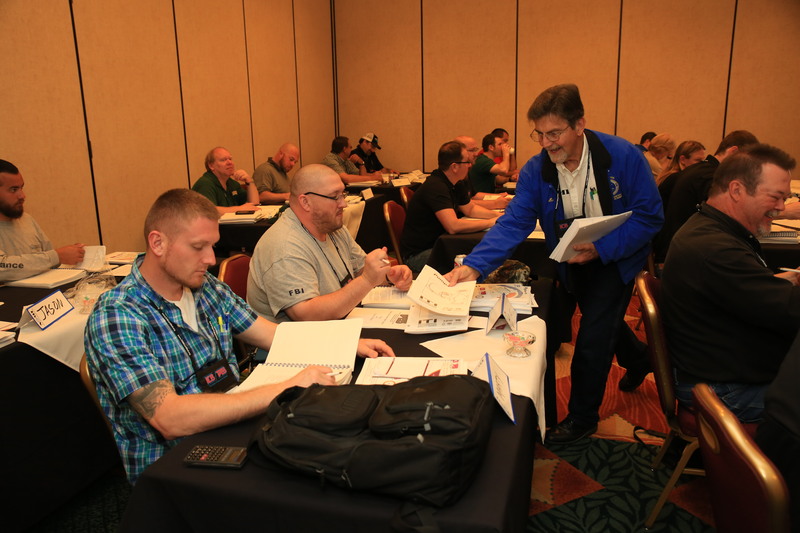 Certification exams offered at this year’s conference included the NEMI HVAC Fire Life Safety Level 1 and 2 Supervisor, NEMI TAB Supervisor, and NEMI Sound and Vibration Supervisor. All who took the HVAC Fire Life Safety Level 1 and 2 Supervisor exam passed, six out of eight passed the Sound and Vibration Supervisor, and nine of 18 passed the TAB Supervisor exams. Through certification, ICB and NEMIC aim to increase employment and stay at the forefront of emerging market business opportunities. In the last 14 years, more than 8,000 sheet metal workers have gone through certification. This year marked the debut for the NAFA Level 1 Technician, EPA 608 Technician, USP 797 clean room standards and fume hood testing. The Smoke and Control Technology course was led by Dr. John H. Klote, a highly regarded expert in the field. Klote is renowned for his expertise in smoke control, having authored many books, technical papers, articles, presentations and adult education courses. He also has 19 years of fire research at the U.S. National Institute of Standards and Technology. “Not only did I learn about the characteristics of fire and smoke, I have a better understanding of how they design systems for specific structures,” said Hyrum Valdez, assistant training coordinator at Sheet Metal Workers Local No. 88 in Las Vegas. Bryan Nunley, operations manager for Systems Commissioning, Inc. in Houston, led the USP 797 Cleanroom Standards and Fume Hood Testing seminar. “USP 797” refers to chapter 797: “Pharmaceutical Compounding – Sterile Preparations” in the United States Pharmacopeia National Formulary, a book of standards in the pharmacy industry. Although most compliance testing is done by certification firms – and rightly so – aspects of testing and compliance, such as air change per hour, differential pressurization, particle and temperature/RH measurements and adjustments and repairs, can be performed by TAB technicians. A TAB company can network with a local certification firm to become a trusted partner for when issues with a pharmacy gaining or maintaining compliance are encountered. A TAB company that understands chapter 797 can earn additional work for a long time to come, Nunley said. Patrick Braham, TAB supervisor with Air Management Industries aligned with Sheet Metal Workers Local No. 105 in Los Angeles, reported his small shop of three employees has been doing a lot of this type of work. He hasn’t been the boots on the ground for USP 797 work, but if the company keeps up the positive reputation they have in the niche, he soon will be. Currently, 75 percent of the work completed by Air Management Industries is in hospitals, Braham said. Growing market share and opening doors to new opportunities is constantly on the minds of some contractors as they continue to expand their businesses. Matt Cole, field operations manager and TABB certified supervisor for Wing’s Testing and Balancing Co. in Branford, Connecticut and Pat Pico, industry consultant and TABB certified supervisor and technician, focused on testing, adjusting and balancing as a business to be expanded, including using many of the same skills and instruments already in use. The foundation of growing opportunities is earning the certifications to become an industry authority. Cole and Pico covered equipment certification testing, including accessory testing in fume hoods, bio safety cabinets and kitchen hoods, repetitive annual services that generate recurring revenue. It also allows the company the opportunity to include a sticker with their logo as a reminder of when the unit was last tested. With few contractors doing this work across the country, the demand is real, they agreed. Some of the work left untapped by many TAB contractors includes: medical compliance, indoor air quality and sound and vibration testing, HVAC building system commissioning (for new and retrofitted buildings), mechanical systems inspection, duct testing and cleaning, pre- and post-construction inspections and functional performance testing for the verification of system installations and control operations, and energy audits. The conference is a good place for men and women in the industry to see what else is out there, Holt said. “If it’s going to help our contractors get more projects, and put sheet metal workers to work, it’s a success,” he added. An emerging market discussed at the conference is infection control risk assessment (ICRA), which focused on the realities of construction sites within today’s health care facilities. More than 98,000 patients die annually from hospital-acquired infections, which makes this a growing problem the unionized sheet metal industry can help solve, said instructor Len Leibert. In addition to the basics of ICRA, Leibert also discussed the chain of infection, the Centers for Disease Control and Prevention recommendations for environmental infection control, and why ICRA is the next frontier. Another added bonus to the ICB Conference is the caliber of speakers it attracts. Imparting knowledge and educating the industry’s finest keep communication flowing and keep members abreast of emerging markets. During Klote’s seminar, for example, he discussed the fundamental concepts of smoke control including its objective, the reasoning behind smoke control codes and standards, types of smoke control systems, system activation, commissioning, acceptance testing, design fires and smoke production. The systems discussed included stairwell pressurization, elevator pressurization, zoned smoke control and atrium, or large space, smoke control. Klote demonstrated fire and smoke pathways and the speed at which fire and smoke can overtake a structure. Because of this, life safety systems need commissioning, acceptance testing and periodic testing. The whole idea of the conference is to put pieces together that are often scattered around the country. When you share information and bring people together, communication happens and what comes out of it pushes the industry forward, Holt said. Another key component to the conference is the recognition of members and their achievements. Additional recognition went to Sheet Metal Workers Local No. 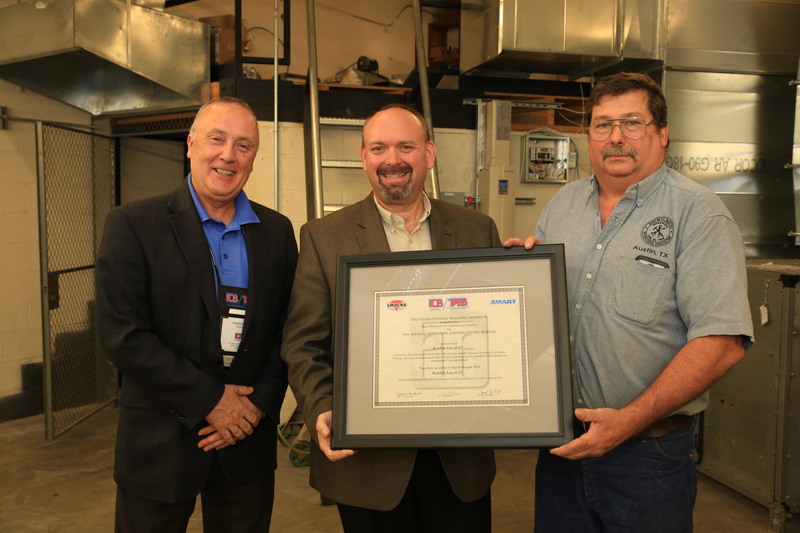 24 for its commitment and achievement in promotion of the HVAC Fire Life Safety program; the Bay Area SMACNA chapter for its promotion of the certification programs with member contractors and the industry; and David Dias, business representative for Local No. 104 for success pertaining to energy utilization and limiting the use of flex duct in building codes. The TABB Hall of Fame inductee this year was Denny Kapowitz, a TABB-certified professional with TNT Solutions, Inc. in Spicewood, Texas. “I have been enjoying my opportunity to pay it forward and share my experience with the next generation,” he said.